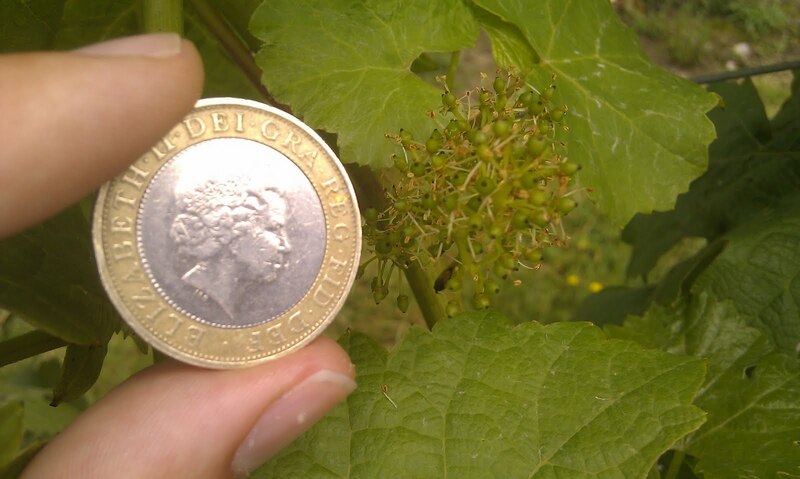 I still haven't got a clue what grapes these will turn out to be: the vine was in the garden when Mrs Lowe and I moved in, and this is our first summer here. If anyone out there thinks they're up to the challenge of identifying them, please get in touch. For reference, here's a picture I took on the very same day in the Chapel Down Vineyards, Tenterden, Kent. 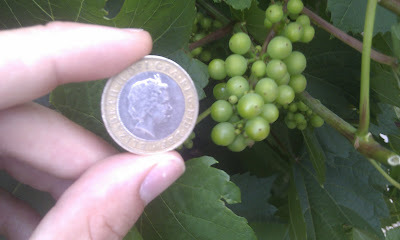 These are Bacchus grapes, destined for the 2011 vintage Chapel Down Bacchus. If the 2010 is anything to go by, this will be a cracking wine, and I feel very priviledged to have seen it in its infancy. If there are any of you out there who remain to be convinced that England can produce great wines (yes, great, not just good), then I urge you to seek out this wine and prepare to have your mind changed. 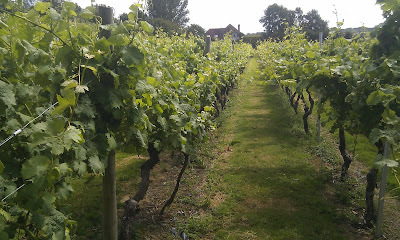 This is the vineyard in question, one of 23 (if I recall correctly) within the Chapel Down estate. Maybe one day I'll get a back garden that looks like this. For now, I'll keep tending to my little vine, and be thankful for what I've got.